Ask fellow campers about "Bonito Campground (USFS)" and nearby attractions. this is a great USFS campground with flush toilets. Spots are very spacious. right at the entrance to Sunset Crater. First come first serve. We camped at Bonito Campground (USFS) in a Fifth Wheel. This is a very nice Forest Service campground. No hookups but potable water spigot at each bathroom. Sites are generous, bathrooms have flush toilets and sink. Facilities and entire campground are very clean and neat, in large part because of the excellent hosts. Within walking distance to trails and the entrance station to Sunset Crater. A 35 mile loop takes you from the entrance station through Sunset Crater Nat'l Monument and Wupatki Nati'l Monument and back down Hwy 89 to the park. Great spot, will return. We camped at Bonito Campground (USFS) in a Travel Trailer. We spent 4 night here so that we could camp with our adult children and granddaughter. We chose it because of nearby national monument attractions and also because it was a beautiful location. Our only complaint was the lousy installation of the picnic table! It was on a slight downhill grade and they didn't level it properly! Not a huge deal, just aggravating. As others have stated there wasn't any cell phone coverage which was nice for all of us to be unplugged for the week end. We all had a great time and would definitely stay here again. We had to pay extra for our visitors vehicles! We camped at Bonito Campground (USFS) in a Fifth Wheel. This is CG is dry camping with flush toilets and water spigots, in the middle of northern AZ pines. The whole CG is very clean but the volcanic cinder tracks into the motorhome at every opportunity. There are smaller pull-through sites along the side of the main drive as well as larger back in sites radiating out. Our pull-though was very level and trees were cut back to clear our roof. The only downside is that there's absolutely no cell signal. Driving 2 miles toward Highway 89 will get you usable signals. We camped at Bonito Campground (USFS) in a Motorhome. This CG is at the entrance to Sunset Crater NM. It's also 12 miles from Flagstaff so shopping is convenient. For outstanding steaks, try Horsemen Lodge 11 miles down Hwy 89 toward Flag. For authorized Onan generator service, go to Flag Tool, 12.7 miles down Hwy 89. Wow: loved this place. It does not take reservations, and we came in July, late in the day. Lots of lovely, spacious spots to choose from. The rangers say it is the last to fill up. Forested, natural sites, level, far from your neighbors. There is a ranger program, toilets. Very peaceful. Great location for Walnut Canyon, Sunset Crater, Wupatki ruins. No hook ups. I will return. The staff was so very accommodating, friendly and checked on us soon after arrival. They will deliver ice and firewood for a fee. We camped at Bonito Campground (USFS) in a Motorhome. Close to enough, but feels far in the wilderness. We stay here every time we are in the area. There are sites that are just a pullout and others that are back in type. Some are big enough for big motorhomes and tents are welcomed. No water, no sewer, no dump. There is potable water near restrooms and they allow you 5 gallons. Thin forest atmosphere, very well maintained. Flagstaff and area is a Dark Sky area. No outside lights. Great area to stargaze. The Camphosts are very friendly, they sell firewood and have an ice machine at the campground also. Rangers have presentations at the amphitheater on weekends, also other activities like hiking. We camped at Bonito Campground (USFS) in a Motorhome. Campground is across from Sunset Crater visitor Center. Wupatki Ruins is in the area also. Plenty of shopping in the area just south of the campground. Weather is cool, 7200'. This is a great campground. The only reason I wouldn't give it a 10 is there are no utilities and water is very limited. Spots and location (just outside Sunset Crater) are beautiful. We would stay here again. We camped at Bonito Campground (USFS) in a Fifth Wheel. This was a one night stay while we were on the road but I was surprisingly pleased with the area. It is dry camping and so with some preparations, I think it would be a great campground for a few days. I liked the amount of space between sites. It is not very private just because of the vegetation type of this high desert area. But it felt like old time camping. Will come back if ever in the area. We camped at Bonito Campground (USFS) in a Travel Trailer. Lots to do in the area.......archeological sites, Grand Canyon is a few hours away, hiking galore in the area and Flagstaff of course if you want civilization. Down the freeway is Meteor Crater and Petrified Forest National Monument. Lots to do in northern AZ. Beautiful location, quiet, but come prepared to dry camp. No water available for RVs, no dump station. Closest facilities in Flagstaff. 50% senior discount price is $10. Friendly host but just 1 for 40+ sites, 2 Restroom buildings with flush toilets and sinks, clean. Drinking water at RR buildings to fill a container. Close to Sunset Crater entrance and easy walking distance to its visitor center. Peaceful, no TV reception or cell service unless you hike up the mountain or out near the highway. We camped at Bonito Campground (USFS) in a Fifth Wheel. Sunset crater national monument is right there. Shopping in Flagstaff at mall/shopping center, about 10 miles. Fascinating geology with lava and cinders everywhere under tall Ponderosa pines. About 7000' elevation so nights are chilly. Very scenic and quiet spot, located on the Bonito Lava Flow just outside Sunset Crater Natl Monument. All paved spots, some back-in and some pull-offs. Most seemed small to medium size. We took one of the longer pull-offs and needed it all for our truck and 23 ft trailer. Park had just opened for the season, so one of the 3 restrooms was still closed, but midweek this was no problem. Totally dry camping, with no cell signal whatsoever. Limited water, so they ask that you not fill RV tanks. 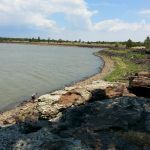 We enjoyed the peace and quiet, as well as Sunset Crater and the Wupatki ruins. Rate reflects Senior Pass rate. We camped at Bonito Campground (USFS) in a Travel Trailer. A great place. Ranger programs weekend evenings. All paved roads and sites. Hosts extremely helpful and they enforce the rules, which are simply common sense. Rate reflects Golden Age Pass. We camped at Bonito Campground (USFS) in a Motorhome. Very simple park, good for a couple of nights. It rained on us both days but they are in monsoon season, so it was to be expected. The hosts were very helpful. We camped at Bonito Campground (USFS) in a Motorhome. Forget the Parking lot RV parks and stay here if you are in the area. 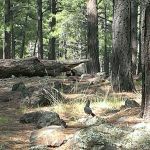 This is a beautiful place in the huge pines of Flagstaff AZ. Restrooms are clean and there are 3 of them, no showers. Large spaces for tents or RV's. 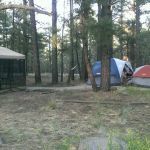 No hookups, water or dump that I saw, so come ready, and enjoy the quietest night of your life, breath in the pine scented forest, take the short walk to the Sunset Crater NP Visitor Center adjacent to this campground. I just love this place. The price of $9 is senior rate, normally it is $18. With the exception of the tall pines, everything here looked very new. We camped at Bonito Campground (USFS) in a Motorhome. 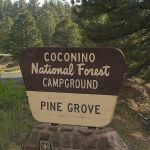 This camp is in the Coconino National Forest. To add to the previous reviews, this is a lovely sylvan camp, well maintained, with helpful hosts. There are around 15 pull-through sites and a few are set up for wheelchairs. We enjoyed the drive and photography opportunities in Wupatki National Monument, as well as into Flagstaff Old Town. We would definitely return. We camped at Bonito Campground (USFS) in a Motorhome. This is a great "dry camping" type campground in the cool pines. Located about 10 miles north of Flagstaff on Hwy 89. Campground is adjacent to the Sunset Crater Visitor Center. The $9 rate reflects Golden age pass otherwise $18 night without the pass. Sites and roadways are all paved. We camped at Bonito Campground (USFS) in a Travel Trailer. This CG is at the entrance to Sunset Crater NM. It's also 12 miles from Flagstaff so shopping is convenient. For outstanding steaks, try Horsemen Lodge 11 miles down Hwy 89 toward Flag. For authorized Onan generator service, go to Flag Tool, 12.7 miles down Hwy 89. Are you affiliated with Bonito Campground (USFS) ?